The fourth annual Telluride Fire Festival returns to Mountain Village on a new weekend this ski season! The three-day fire art event takes place December 7-9, 2018. Each year in Nevada’s Black Rock Desert, a city of more than 70,000 people rises out of the dust for one week. During that time, enormous fire art installations are erected and many are ritually burned to the ground — never to be seen again. This temporary city is known as Burning Man. The Telluride Fire Festival honors this influential phenomenon in contemporary American art and the many artists whose works of fire art can often only be witnessed at Burning Man. The Fire Festival showcases stunning works of art unique to this desert happening. The Telluride Fire Festival ignites this December 6 during Telluride’s Artwalk with an exhibit and reception at Slate Gray Gallery, in downtown Telluride. 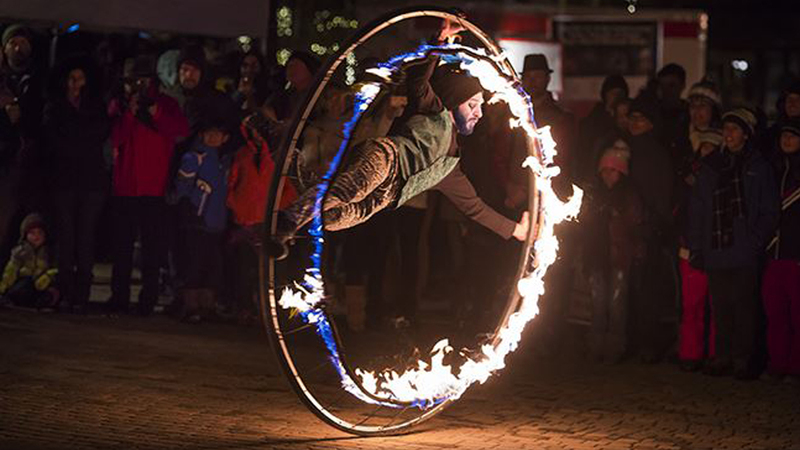 Fire performances and fire art installations are slated in both Mountain Village and Telluride Friday, Saturday and Sunday nights, and during the day, free flow arts workshops will be available for people of all ages at the Wilkinson Public Library. Festival Hospitality will be at the base of Lift 4 in the Mountain Village Center each day of the festival 11 a.m.-4 p.m. Hot Time in the Old Town, Friday Dec. 7 & Sunday, Dec. 9, 5-8 p.m., Transfer Warehouse. Be amazed. Experience, interact, and even operate fire sculptures and be entranced by fire dancers at the roofless historic Transfer Warehouse. Enjoy music by Beatrixx Kiddo & DJ Kentendo with MC by Telluride Theatre’s Colin Sullivan. Hot drinks at the cash bar at this one-of-a-kind event. Food and snacks for sale as well. Fireside Soiree, Friday, Dec. 7, 8 p.m. (doors at 7 p.m.), The Bob Theater (in the Palm Arts Complex. an up-close and personal cabaret style performance of mind-bending stunts and comedy produced by Homestead Circus Productions…sans fire. Fire Ball, Saturday, Dec. 8, 9 p.m., Great Room at San Sophia Gondola Station. This wildly outrageous event will feature music, fire performers, aerial silk spinners, jugglers, open bar and more. Plus, Fire Ball attendees will have access to the Fire Sculpture Garden atop the ski area. Free Fire Dancing Performances in Reflection Plaza on Saturday, Dec. 8 from 5 to 8 p.m.
Arizona fire artists Chris Turner and Michael “Oaks” Wright are creating a unique piece entitled “Pinwheel Snowflake”, which will be lit from within. Skiers will marvel at its complexity of design during the day and then — in true Burning Man form — it will burn to the ground Saturday night during the Fire Ball. Country and Chaos Collaborations, also out of Arizona, will be showcasing their beautiful Fire Flowers and the interactive Easty Beasty, which shoots flames high into the air. Country and Chaos Collaborations is the joint effort of Arizona Burners Nick Rice, Kristin Wesley, and Lance Greathouse. Denver artists Mark Switzer, Craig Sanchez and Jed Winters are contributing their Camp Wardrobe MalFUNKtion fiery arch. Built as a sign for Camp Wardrobe MalFUNKtion at Colorado’s regional Burning Man event, Apogaea in 2016, the arch incorporates Apogaea’s logo, a simplified image of the sun crested on the horizon of the earth, illuminating an arch of the planet. Guests at the Transfer Warehouse will walk under the arch while flames shoot into the air above them on arrival. Returning artist Keith D’Angelo will have a new fire sculpture at the Fire Sculpture Garden along with an exhibit at Slate Gray Gallery: Out of Focus – A Visual Commentary On Gun Violence. Keith’s LOVE is set to burn along with three other wood sculptures at 9:30 p.m. December 8. Each letter is eight feet tall and five feet wide. The Telluride Fire Festival, a 501(c)3 organization, is an interactive fire art experience offering fire related workshops and outdoor displays of fire artistry to support artists and enable all to immerse themselves in the many forms of fire art. For more about the Festival or to volunteer for the festival, visit telluridefirefestival.org.